Should You Try Google’s Responsive Search Ads? Google’s machine learning powers their new responsive search ads. This means that customer searches can have more efficient responses when advertisers create ads that match search ideals. But should you try Google’s new responsive search ads? In this article, you’ll learn more about this new option so you can make an informed decision. Responsive search ads are Google’s largest and most adaptable search ad format to date. Previously, ads were composed with headlines and descriptions coming together to make one static ad text. With responsive search ads, you can create up to 15 headlines and 4 descriptions that can be arranged in tens of thousands of different ways. Testing possibilities are nearly endless. As Google tests different sequences of headlines and descriptions, it learns which achieves optimal performance. And as time goes on, responsive search ads provide the best information to searchers — dependent upon keyword search, device, and browsing history. This is a huge potential boon to digital marketers in every industry. Here are some of the main things to expect with this rollout. Google’s new system can show as many as three 30-character headlines, up to two 90-character descriptions, and URL with two 15 character path fields. In contrast to even expanded text ads, that’s one more description with 10 extra characters to use. This makes Google’s responsive search ads the most sizeable of all search engine results pages ever. Additionally, they can be used in conjunction with any ad extensions. More real estate on the SERPs? Yes, please. Responsive search ads are malleable and will appear in different shapes and sizes to match the scenario. For instance, mobile and other small screens will most likely display fewer components – two headlines instead of three and one description rather than two. So, instead of creating unique campaign criteria and writing individual ads for each campaign, marketers and copywriters can now craft one set of ad copy that is automatically optimized. According to Google, responsive search ads enjoy a 5 – 15% higher click-through rate compared to standard search ads. Will you see the same benefit? That depends on a lot of factors. For instance, if your industry is extremely competitive, it may be tough to see a huge lift. However, you won’t know for sure until you test. Add a responsive search ad to the mix of static ads in an ad group to see how it performs. Make sure to utilize every line of copy that you can for the optimal test. As many as 15 headlines and up to four descriptions can be tested simultaneously, so get creative and really put machine learning to the test. Google won’t display a responsive search ad if headlines or descriptions are too similar. Be creative and differentiate each element of the Responsive Search ad, such as highlighting different value props, special offers, and call to actions. At least two of your headlines should include a relevant keyword. If you really want to get fancy, you could even use Dynamic Keyword Insertion to insert your keywords into responsive ads. You’ll also want to Include headlines that don’t include your keywords to prevent repetition. It’s a great opportunity to add a unique flavor to your ad that can only come from your brand. As you build your responsive search ads, Google will show you a preview of different headline and description combinations. This can be a helpful tool to gauge if your headlines are too similar or repetitious. Headlines will be tested in different positions to see their performance in each headline spot. Each headline won’t display every time. This allows Google to optimize the message for each user and device being used. If there is a specific message, like a brand or disclaimer, this can be “pinned” to the ad so it’s always visible. They should be minimal and poignant, as doing so will restrict some of the automatic variant testing which could negatively impact the ad’s overall response performance. In fact, Google has shown that pinning just one headline reduces the amount of testing that can be performed on these responsive search ads by more than 75%. Pinning two headlines reduces the opportunities for testing down 99.5%. So be sure to exercise restraint when it comes to this feature. Google is not removing expanded text with the addition of responsive search. 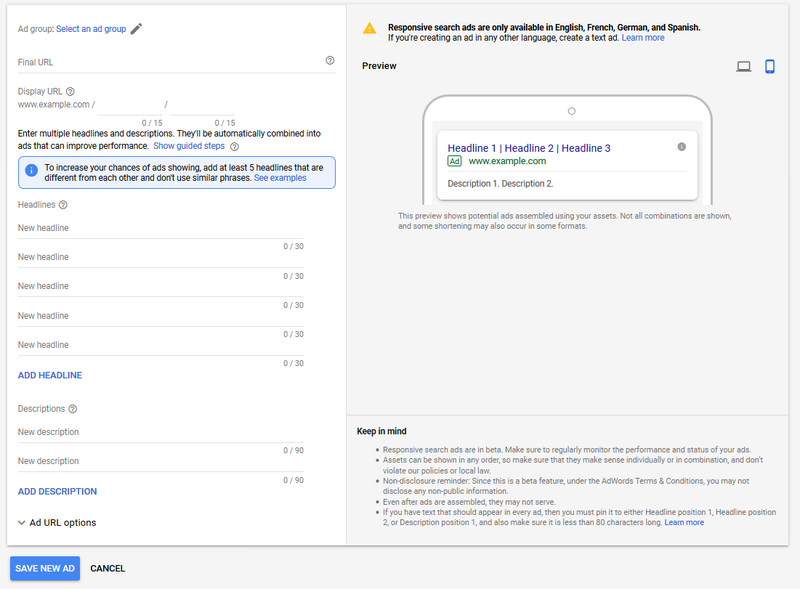 Google even suggests running at least one expanded text ad in each ad group along with your new responsive search ads. Doing so will assist the responsive search ads testing and assure your ads appear as often as possible. It’s redundant to place multiple responsive search ads in the same ad group as Google automatically tests the various elements of your responsive search ads against one another. The optimizations of the ads will slow significantly if more than one is being tested at once in the same group. Think you’re ready to start planning an ad campaign around Google’s Responsive Search ads? Review your current ad copy as soon as possible. Google Ads Grader will quickly locate top performing ads and utilize elements from them as building blocks for alternative headlines and descriptions for responsive search ads. Search your account thoroughly for all offers, messages, value props, and calls to action that are top performers for the account. High-quality headlines and descriptions are what makes an exceptional responsive search ad. You don’t want to be left behind without being prepared for the biggest expansion and improvement Google has created for its searches in recent years. Polish up your ad copy and have it ready to go – then watch your bottom line grow!